This outfit came to me while I was shopping in Soho and saw a striped dress merchandised a couple feet away from an epic patterned cardigan. I was caught off-guard that the two pieces were speaking so clearly to me as they were repping completely contrasting color schemes. It was at this moment I knew my style-change was in full force. The garments were a little out of my budget so unfortunately I had to pass, but the fit was something I needed to do in some way, shape, or form. I ended up finding this dress at Forever21 (killing it right now by the way) the dark colors, narrowness of the lines, and incredibly high side-slit detail were a slam dunk. 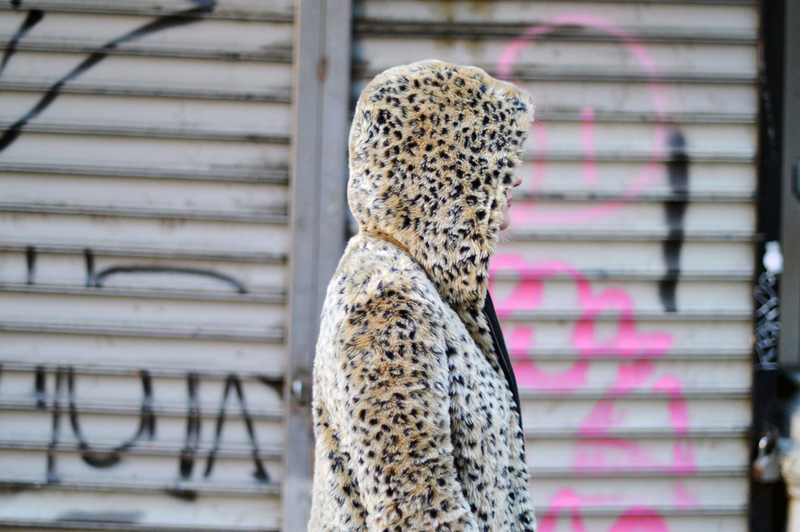 I went through a few patterned cardigan/coat pairings before it dawned on me that my very own leopard fur was more than perfect. **Side note, another great pattern mixing trick: stripes and animal prints**. Starting to look club-kid-LES-chic, fishnets were a must. Had to go with a patterned patent heel and these chunky tortoise take on the Mary Jane were perfect. THE shoe silhouette of 2016. **PLEASE note: this is a general rule of thumb and in no way is meant to be a do or die. Not all stripes pair with all animal prints and I will not be held responsible for your bad outfit.